A team around Francesca Moresco from the Technical University Dresden, Germany, and Diego Peña from the University of Santiago de Compostela, Spain, have now synthesises decacene by plucking oxygen off a precursor that was immobilised on a gold surface. Scanning tunnelling microscopy at -268°C then revealed the elusive acene as a caterpillar-like structure. 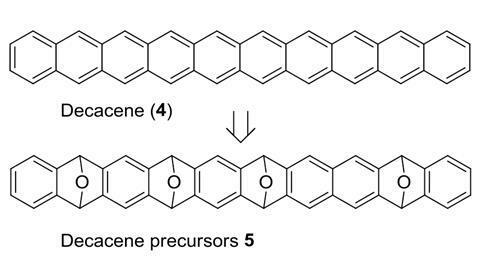 Although decacene is currently too unstable for any practical applications, researchers are interested in exploring its electronic properties – pentacene, for example, is a semiconductor used in organic electronics.